In the recent round of Lottery funding, our Croquet Club has been awarded a grant of £4,500 which will be used to attract more people to the game by providing additional expert coaching and purchasing more equipment. we are most grateful to the National Lottery for this grant which will provide a real boost to the club. We are also grateful to members of the Committee, particularly Bill Strachan, Charles Henderson and Brian Clark, who put in many hours preparing the application. 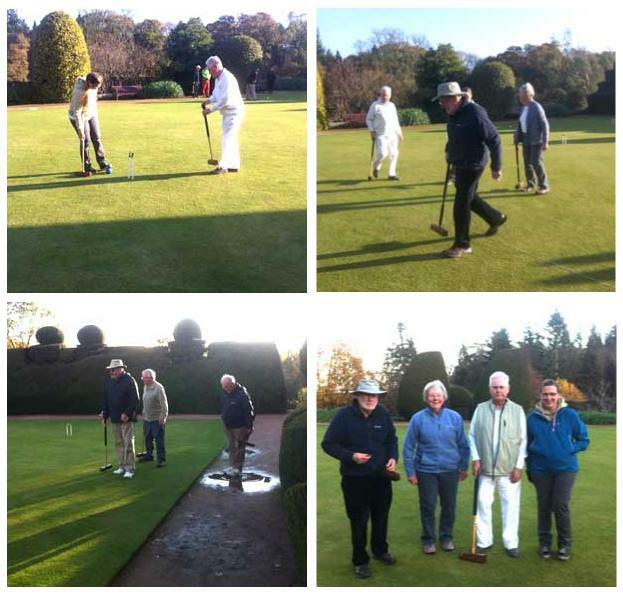 This fun competition was held at Crathes on Sunday 2 November with 12 players taking part. As shown in the pictures below, the competition started out in bright sunlight (top left) but as the shadows began to drawn in (top right) and then get longer (bottom left; why are you paddling, Robert? ), the winners at the end, Brian, Jen, Charles and Jocelyn (bottom right) were showing distinct signs of hypothermia! Many thanks to Charles for organising the competition and to Marie for the pictures. 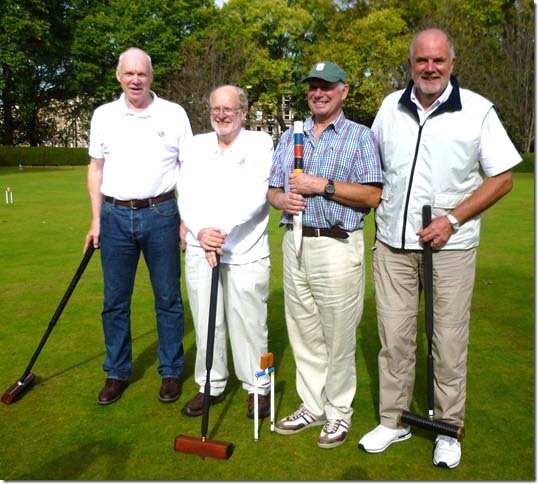 CCC reached the final of the SCA Inter-Club League with wins over Edinburgh and Glasgow clubs but could not overcome a strong Auchincruive team who won the League in a match played at the Meadows on Saturday 27th September. Dave Arnot (2) beat Brian Clark (14) +10 and Malcolm Smith (12) beat Bill Strachan (16) +3 on time. Both Brian and Bill had been part of winning teams in earlier rounds. 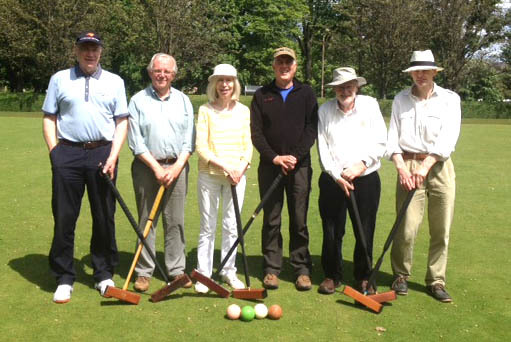 Thanks to a lot of organisational work by Brian Clark with his many Croquet Club contacts in the North of England, six members of the CCC embarked recently on a tour of clubs in the North of England. Pictured below (anticlockwise starting top left) are the group with players from Bamburgh, Middlesbrough, Penrith and Keswick clubs. The tour was both successful and enjoyable and CCC wishes to thank all of the clubs for their hospitality. Congratulations to Malcolm Robertson on winning the CCC Singles final beating Charles Henderson 15 – 11 in a match delayed because of rain during the finals weekend earlier in the month. Well done also to Robert Bell and John Usher who took the CCC Doubles title by beating Charles Henderson and Peter Carter in the final. 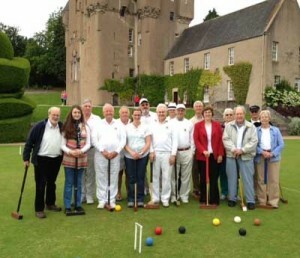 The NE Scotland Festival of Croquet held on 13th and 14th September was a great success. Playing on lawns at Albury and Westburn the handicap singles competition was run in four blocks with the semi-finals and final played at Albury. Congratulations to David Houston who beat Alasdair Adam in the final – a full report of the tournament can be viewed on the SCA website. 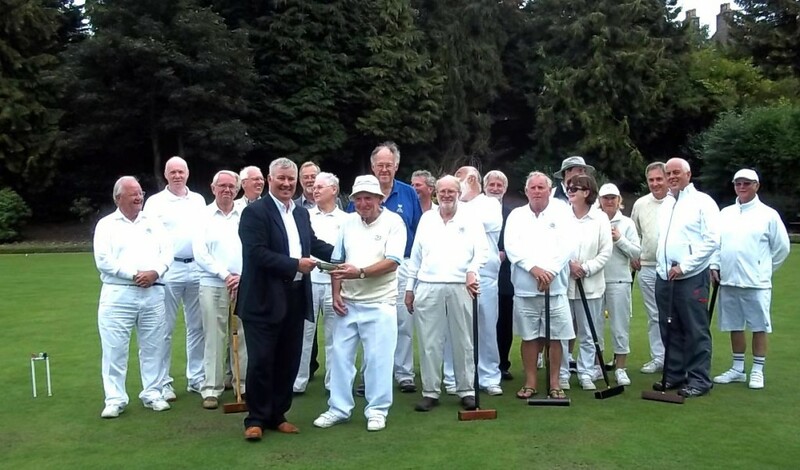 Crathes Croquet Club is very grateful to Sport Aberdeen for their continued support and to the City Council for hosting a Civic Reception at the Town House on the Saturday evening. 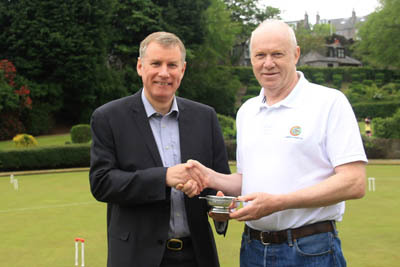 Alistair Robertson, Chief Executive of Sport Aberdeen, presenting the trophy to David Houston. 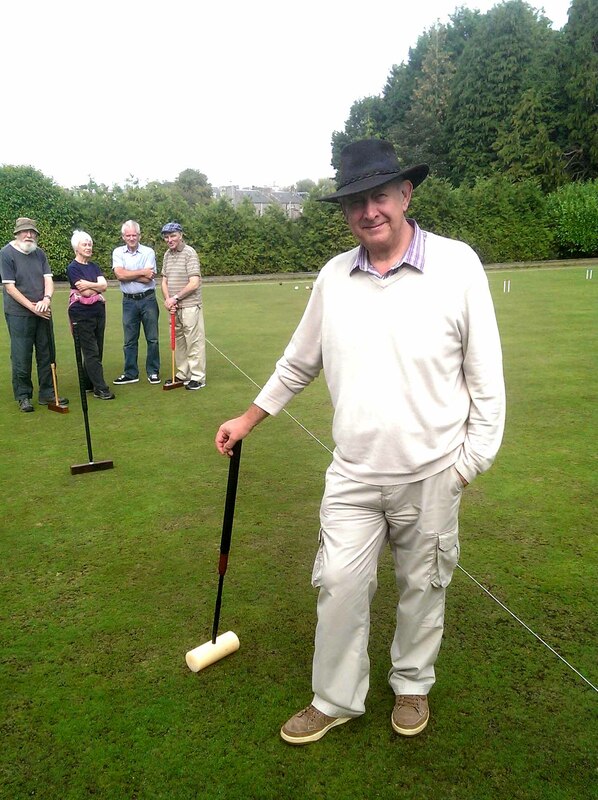 The days of sartorial elegance on the croquet lawn are not over as we see Dave Colling taking a brief rest to pose for a photo opportunity during a Wednesday afternoon round robin of Golf Croquet at Albury. Several admirers looked on but the others apparently continued with the play. A reminder that there will be a Special General Meeting at the Albury Sports Centre on Saturday 6th September at 10.30 am. The only business is to consider amendments to the Constitution, necessary to facilitate a grant application to extend the Club’s facilities. Registered users can view details of the proposed changes by following a link under the About Us menu item. Congratulation to Club Captain, Charles Henderson on winning the Walter B Laing Trophy, one of the events held during the Edinburgh Tournament at Fettes from 4th to 9th August. Charles beat Chris Martin 15-13 in the final. One consequence of Charles’ successful play during the week, however, was that his handicap was reduced to 16! Charles is pictured below with his opponent Chris Martin and receiving the Trophy from Meadows Club Veteran, Ian Wright. The weekend of 14th/15th June was both enjoyable and informative with a high proportion of CCC members participating in a series of coaching activities at both Albury and Crathes ranging from the basics of shot making to tactics for match-play as well as some advanced game strategies. The Club is extremely grateful to Bob Burnett, Alan Pidcock and Ray Lowe for taking the time to visit and to impart their very considerable knowledge of the game. 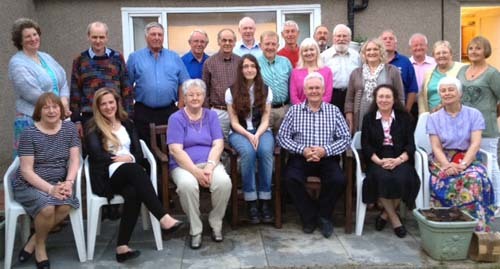 The satiated social gathering – Eleanor is seated third from left and Margaret standing at the back far right. 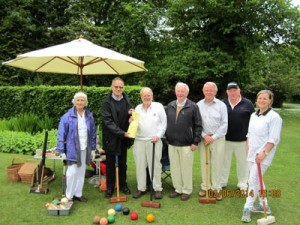 Many of the croquet discussions extended to our social evening that was greatly enjoyed by all. Many thanks to Club Captain, Charles, for organizing the event and also to Eleanor, Margaret and their helpers for providing the truly sumptuous buffet! On 7thand 8th June, the East v West Competition held at the Meadows in Edinburgh experienced an invasion from the North and, armed with their relatively high handicaps, the team had some creditable performances, finishing up 8 – 5 against West but losing 7 – 9 against East. 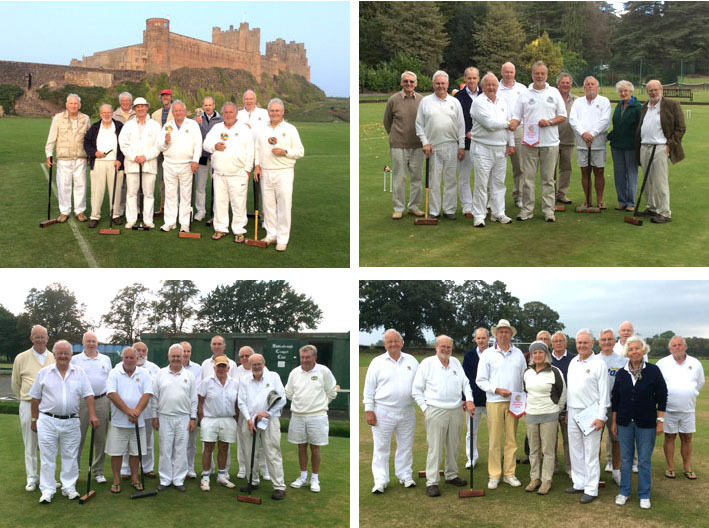 This fun event, masterfully organised by Fergus McInnes, involved both Association and Golf Croquet played on full or half-sized courts. 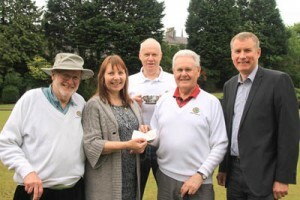 Thanks to the Meadows Club for their excellent hospitality – this event will surely now be firmly fixed in the North’s calendar. Crathes Croquet Club members participated in the Albury Sports Centre Fun Day held on Saturday 24th May explaining the game and giving the opportunity for a free ‘taster’ session. 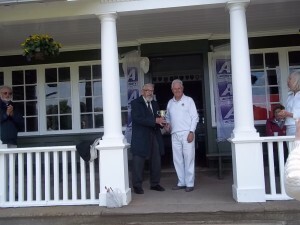 During the proceedings, Bill Strachan was presented with the 20+ Singles Trophy he won in Edinburgh. The Trophy was presented by Lord Nicol Stephen who had been invited to open the Fun Day. Captain of the Club, Charles Henderson, also took the opportunity of presenting a cheque to Joyce Scott of Albury Sports Centre as a donation to their funds. 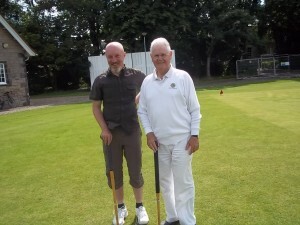 Congratulations to Brian Clark on retaining his title at the Kinross 11+ Tounament held at the Green Inn on Monday 2 June. With surprisingly few rain showers during a very pleasant day of croquet, the 7 competitors initially played 2 games in separate pools and this was followed by semi-final and final matches (for full results and report see the SCA website). 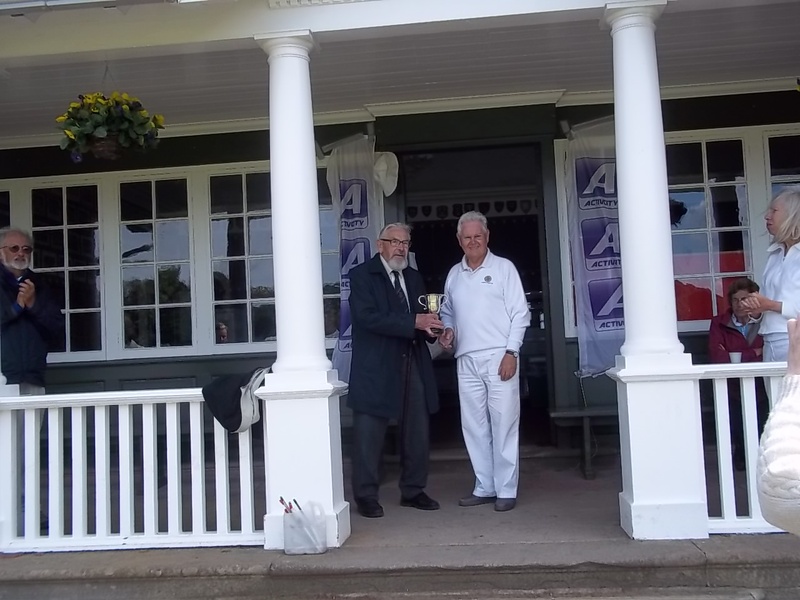 The picture shows Brian receiving his prize (not a cup – more of a cup-filler!) from semi-finalist Ian. After the semi-finals, the winner was bound to be from the North as Brian beat the other CCC representative in the final. Many thanks to Alistair Malcolm for excellent organisation of the competition and for arranging the very enjoyable afternoon extras in the form of tea/coffee and cakes. Please note that coaching sessions do not exclude any current member from playing croquet and, even though the coaching sessions are not displayed on the website footer, these times can be booked by clicking on the appropriate event under Calendar. The Croquet season will soon be with us! Our Open Days this year will be at Albury Sports Centre on Sunday 27th April and at Crathes Castle on Sunday May 4th from 11.00 am at both venues. Just turn up, or better still, let Robert Bell (01224 732067 email), Brian Clark (01224 867159 email ) or Charles Henderson ( 01224 313555 email) know you will be coming. If dates not suitable contact one of us to discuss options.